As I mentioned in my January newsletter, every year I choose a word that will serve as my theme for that year. My word/theme for 2016 is SPACE. This year, I’m creating space on all levels of my life (physically, emotionally, mentally, and spiritually), and noticing with curiosity all that’s unfolding as a result. This month, I’m noticing the Power of PATIENCE. 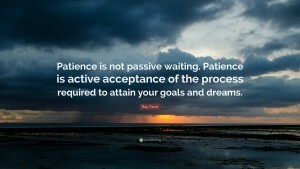 SO – with great gratitude and a deepening sense of peace – I say YES to the Power of PATIENCE. In honour of patience, I offer you an mp3 of my chant “I Walk”; may it serve you well. How about YOU, dear Friend? What’s most resonating in YOU these days? WHEREVER you are on your journey, I’d love to hear from you. Please e-mail me at nathenaswell@me.com; we’re all in this together, and we have much to learn from each other. (BIG THANKS to all of the kind souls who respond to my newsletters; reading your comments is always a highlight of my month. Zoey Wren, fellow Recording Artist and Life Coach (http://zoeywren.com), for her friendship and for all that she does. I’m having a LOT of fun interviewing GREAT souls that are living BIG lives, and having them share the Small Steps that they’ve taken to get there. I’m happy to report that the Men’s groups in Eugene, OR and in Cameron Park, CA, for whom I led workshops last year, are now meeting regularly on their own. If YOU are part of a men’s group, or know of one that could use some support to get started, please e-mail me at nathenaswell@me.com – I’d love to help. As a very dear friend in Montreal once said to me, “All I can offer you is my experience”. My sincere desire, in every one of my newsletters, is to offer Experience, Strength and Hope. Much love to you, dear Friend. May you allow yourself the Power of PATIENCE, and may you go with LOVE.